rec. Philharmonic Concert Hall, Warsaw, 2014. Three or four years ago I went to an Anderszewski recital in which a first half of classical and romantic repertoire was followed, after the interval, by a single Bach Suite to close the programme. On paper this looked odd, a reversal of the usual sequence for a piano recital of standard works. In practice it was a triumph. Excellent playing in the first half was trumped by the most compelling Bach playing many in the audience can ever have heard. This excellently recorded disc is no less compelling and is testimony to Anderszewksi’s outstanding qualities in this repertoire. Caveats first; not everyone likes Bach on the piano but they won’t be reading this anyway. Others have strong views about ornaments and repeats and tempi, which might not agree with those of the pianist, though he is here no less idiomatic or scholarly than most of his recent pianist rivals in this repertoire. The booklet’s track timings are wrong much of the time, and in both directions, being at times too long and at others too short. Thus for the first four tracks on the disc the booklet gives timings of 2:27, 3:58, 1:27 and 1:35. It was this last one that alerted me to the problem, since 1:35 would be pretty fast for a Bach Sarabande. The actual times for those tracks are 3:08, 3:01, 2:01 and 3:45. The notes on the music, by Mark Audus, are more than serviceable, but he has been allotted a low word-count, so they are not therefore as useful as Hewitt’s fascinating essay (Hyperion), with its comments on every movement and many detailed insights. Overall the Warner booklet, which has no notes on the artist, is not worthy of the splendid contents of the disc. Perhaps the first thing to say of the performance is that it is superb piano playing, since Anderszewski deploys all the colours that a modern piano gives him, rather than attempt a more monochrome style in a misguided attempt to mimic a harpsichord. This subtle voicing is evident right from the opening track, the swiftly flowing Prelude of Suite No.3. The works are presented on the disc in the sequence listed in the review heading. At a sprightly dancing tempo, there is also an appealing lift to the rhythm here, a feature of his playing throughout. He takes care to keep his trills birdlike; indeed the ornamentation is always in scale and in time, never disrupting the line. This technical adroitness, allied to stylistic sensibility, makes a movement like the second Bourée of Suite No.1 irresistible. The Sarabandes and their variations, often daringly slow, draw us into another world, one of solitary contemplation rather than stately dance perhaps. Yet the closing Gigue of each Suite displays all the animation and high spirits one wants in such movements. This contrast within each Suite of the withdrawn and poetic, and the exuberant and extravert, is typical of the pianist’s range of expression across all these twenty-four movements. One is convinced, at least while listening to playing of this order, that these suites actually need the modern piano in order to display all the meanings they contain. There are formidable rivals in these pieces. They include Glenn Gould in the 1970s, András Schiff in the 1980s, Murray Perahia in the 1990s, and Angela Hewitt in 2003 to list only some of the leading names over the last four decades. 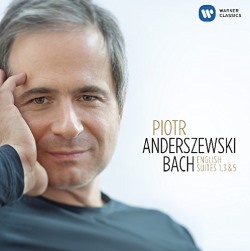 Anderszewski unquestionably belongs in that exalted company, and surely the remaining three Suites will follow. Certainly the recording dates show quite a few days of studio time, so perhaps those others have already been set down. For many collectors Hewitt’s pair of Hyperion SACDs, with supremely eloquent playing, translucent sound, that invaluable booklet, and presenting all six suites in number order, remains the top choice. If and when Anderszewski completes the set to the standard to be heard here, he may yet usurp her crown.